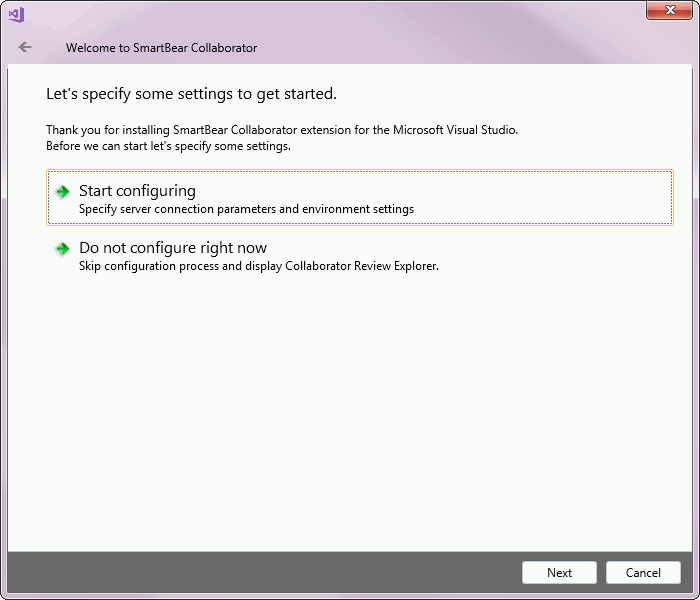 Before using the Collaborator extension for Visual Studio, you must configure it. When you open the Collaborator View window and the extension is not configured yet, it will invoke a Getting Started wizard suggesting to configure connection to Collaborator server and environment settings. Denotes which Collaborator server to use. The Server URL must include the correct port number and path if applicable. If your server uses HTTPS, you may need to install its certificate as described below. Specifies user credentials. The Username and Password are the same as you use when logging into the web server. It is not recommended to use empty password. Enable if you connect to the Internet via proxy server. If you use proxy and want to connect to a Collaborator server that is deployed on your local machine, then specify Server URL in the "Machine_Name:8080" format rather than "localhost:8080" or "127.0.0.1:8080" formats. The URL of a proxy server and its port number. The login and password, if proxy server requires authentication. Click Test to check if you can connect to the specified Collaborator server with the user name and password entered. The fully-qualified name of the Collaborator Command-Line Client executable. The fully-qualified path to a temporary folder, where the extension will keep review materials obtained from the server. This section controls what information will be displayed in the Visual Studio's Output window and in the debug log. You can toggle whether to display or not the information about exceptions, errors, warnings, debug messages or general information messages. The Visual Studio Extension shares SCM configurations with GUI Client and Command-Line Client. In this section, you must select which of SCM configurations the extension will use to upload review materials. Optionally, in the subsections of this section, you may create new or modify existing SCM configurations. Specifies whether to treat path of current open solution as local SCM folder when uploading local changes. Lists the available configurations and displays their parameters. To specify which of SCM configurations the extension will use to upload review materials, select a configuration in the drop-down list and click Set as Default. To create a new SCM configuration, specify its parameters and click Add. To modify an existing SCM configuration, select it in the Configuration drop-down list, change parameters and click Save. For TFS configurations, you can also click Test Connection to verify the connection parameters. To delete an existing SCM configuration, select it in the Configuration drop-down list and click Remove. Lists the available Git configurations and displays their parameters. Specifies the path of local source code location. Specifies the full path to the 'git' command line client. Lists the available Mercurial configurations and displays their parameters. Specifies the full path to the 'mercurial (hg)' command line client. Specifies user credentials on the chosen team repository. Lists the available TFS configurations and displays their parameters. After specifying these values, you can click Test Connection to verify if the TFS server is available. If you are connecting to this server for the first time, a Visual Studio sign-in prompt will be displayed. Controls how Code Viewer and Diff Viewer display comments and defects. If enabled, the Conversations Pane displays comments and defects that relate to a particular line. Otherwise, it displays the entire list of comments and defects. When your Collaborator server uses HTTPS connection and its certificate cannot be automatically verified, or server uses a self-signed certificate, then you will need to install the certificate manually. Note on self-signed certificates: You have to use certificate signed with Certificate Authority (CA). It can be any CA - even yourself. And you must install that CA certificate in trusted authorities. You cannot use self-signed certificate directly. Launch Firefox browser and navigate to Web UI of your Collaborator server. Click the info button to the left of a web page's address. Click the More Information button in the next prompt. This will open the Page Info window. Switch to the Security panel and click the View Certificate button. In the ensuing Certificate Viewer dialog, switch to the Details tab. Select the topmost certificate in the hierarchy and click Export button. Specify a path where to save the certificate in a standard Save File dialog. Double click the certificate. This will open the Certificate Information window. In the ensuing Import Certificate Wizard, click Next to proceed to the Certificate Store page. Select the Place all certificates in the following store option, click Browse and select the Trusted Root Certificate Authorities store. For self-signed certificates, a Security Warning will be displayed. Click Yes to confirm certificate installation. Now Visual Studio Extension is properly configured for HTTPS connection.